It’s summer in Cardiff which means it’s time for Everyman Theatre Company to open their annual Open Air Theatre Festival. 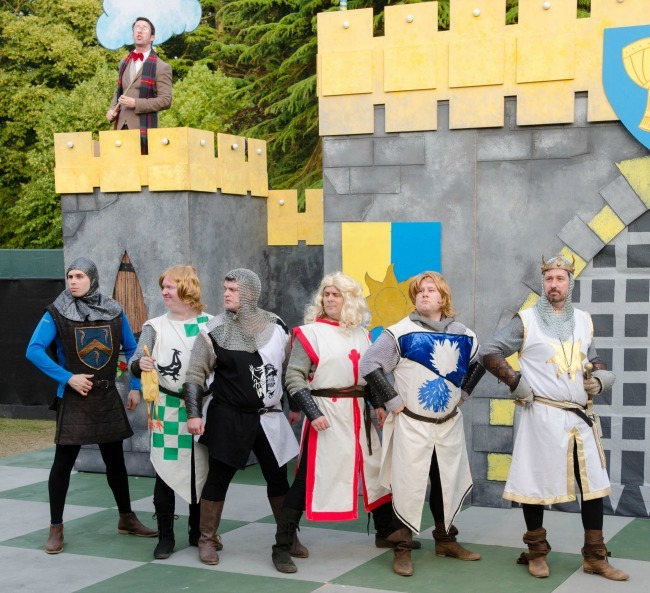 Kicking off – or should that be galloping off- this year is Spamalot. For the un-initiated Spamalot is the musical ‘lovingly ripped off’ from Monty Python and the Holy Grail. Beginning life in New York in 2005 it arrived in London in 2006 and fast became a favourite with Python fans and musical theatre fans. 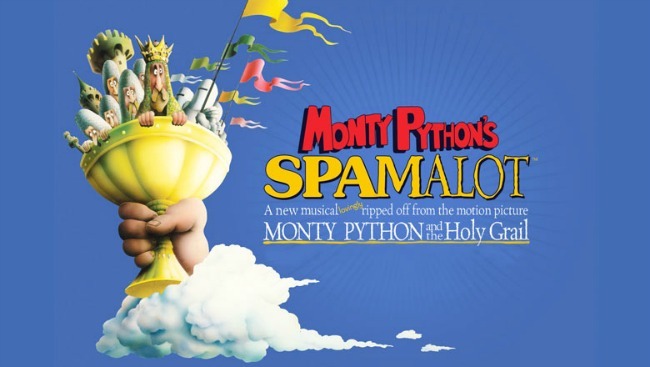 Featuring all the ‘hits’ from the film (and a few other choice Python references thrown in) it’s safe to say if you like Python you’ll like Spamalot. But the beauty of Spamalot is that it’s not only a loving homage to the Pythons, but also to musical theatre. With outright parodies (such as the wonderful and hilarious ‘Song that goes like this) to little nods and references. It also fits the festival well- a musical that almost anyone can enjoy- unless you really hate Spam- and lets the cast show off both their musical ability and comic timing. Richard Tunley has directed an energetic production that walks the line between tribute and mimicry well for the iconic roles. The influences of the original Python roles are all there, but nobody is impersonating the originals, and that really is the only way this show can work. 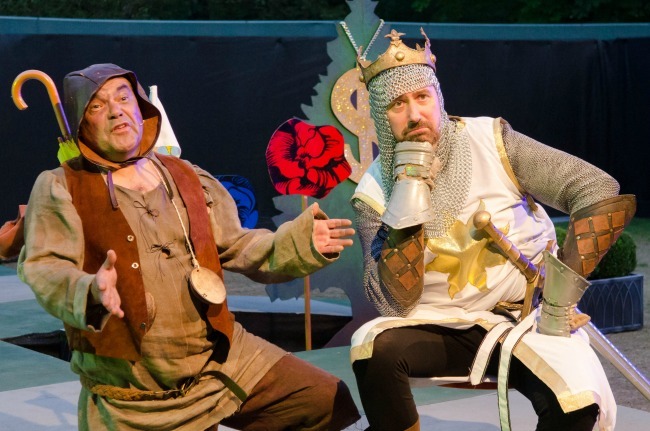 Paul Williams as Patsy and Brian Smith as King Arthur are a brilliant double act (well-rehearsed from their previous Everyman appearances together no doubt) who bounce of each other well. Giving us the long suffering Patsy, diligently following with his coconut shells (which couldn’t have been carried by a swallow, well maybe an African Swallow) Williams is scene stealingly funny. While Smith is a fantastic leading man as Arthur, playing the buffoonery of the role and with a ‘gallop’ that will leave you giggling through the interval. The entire cast has impeccable comic skills, including the chorus. Appearing as everything from a cheer leader to a Finnish Maid the ladies of the chorus embrace their roles- and many a costume change- to deliver comic acting equal to any of the leads. Watch any one of the chorus in a number and you’ll see a full comedic performance, and that was an utter delight. As was to simply watch a musical that is obviously as much a joy to perform as watch. And this is the outrageous fun of Spamalot. It’s both a loving homage to the well-loved film- appearances of classic scenes from the Black Knight to the Knights who say ‘Ni’ to the killer bunny make this a treat for the Python fan. As things get a bit meta in act 2 and the Knights have to put on a musical in Cardiff (or Car-D-ifff as Arthur says) there are plenty of local references and giggles to be had. Honestly the kind of thing that can turn toe-curlingly embarrassing instead of funny, so credit to those responsible for updating those references in the script- they were genuinely amusing. And of course every musical needs a big final number, and what better than a chance to join in with ‘Always Look on the Bright Side of Life’. Whether a Python fan or not, a musicals fan or not Spamalot is a great evening out and in fact might convert reluctant audiences to both! With a hard working cast who have got comedic skills in spades (just watch where they swing them) this is a great start to another year of Open Air Theatre by Everyman. The festival runs from June 22 to July 29 at Sophia Gardens, Cardiff, CF11 9XR. Tickets are now on sale at cardiffopenairtheatrefestival.co.uk or box office 0333 666 3366.